CD and Full Album download purchases come with a free bonus download of The Wrapped EP! Selected and mastered by mainman Martin Bowes. "Over the years I have been moved by the many cover versions of our music that started appearing. Always amazed that people were touched enough by our songs to want to interpret them in their own way. I thought it was timely that i put together an album to represent these works...I hope they mean as much to those listening now as they have done to us...." Martin Bowes. May 2009. 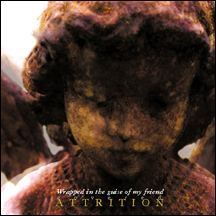 The Wrapped EP is a companion release to Attition's full length release, Wrapped in the Guise of My Friend. This 8 track EP features additional Attrition interpretations from Audra, iammynewt, Phantom vision and more. Murder happens with En Esch - Which Hand?